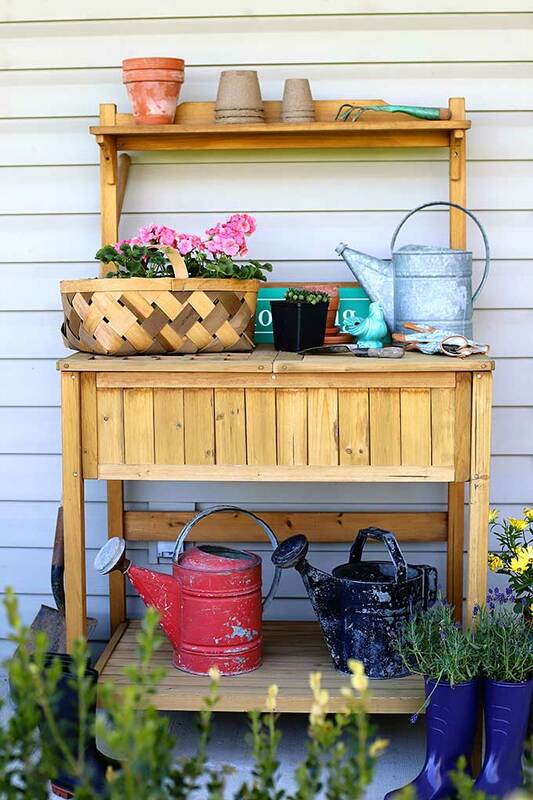 This potting bench does double duty as a garden potting bench and also an outdoor serving station. OK, “tour” might be an exaggeration. There’s no tickets involved or fancy tour guides in tuxedos. But it all started last year when I was bound and determined to DIY a potting bench. I had plans of installing a cute vintage cast iron sink in it, having a hose hookup for running water and even decorating it with some cute vintage garden decor items to gussy it up a bit. It was going to be my version of a she-shed without the shed part. 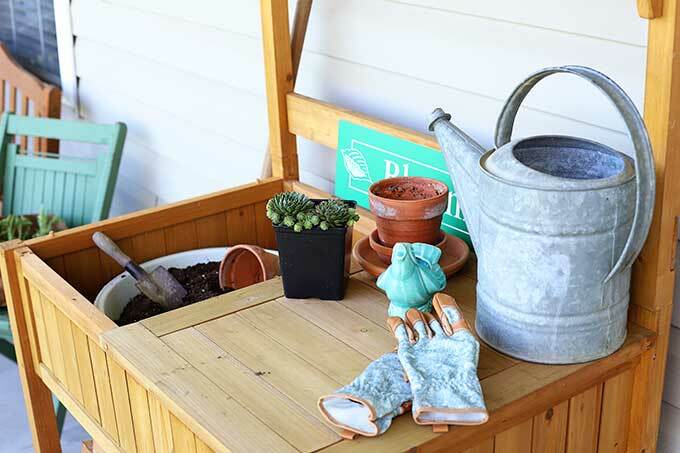 And as inspiration, I showed you a whole slew of DIY garden potting benches in my DIY Potting Bench Ideas post last spring. So many great ideas!!! In all honesty, last year was a busy one for us. My son was graduating high school and we were having a party and before I knew it summer was sneaking up on us and I just needed something quickly. So I ended up BUYING one online, having it delivered by the UPS man and screwing it all together myself. Does that count as DIYing it? If I bought it last year, why am I just taking you on this tour now, you ask? I wanted to make sure it would make it through the winter without having fallen apart, turned gray or spawned termites. We’re good on all three accounts! The pros and cons of this piece of gardening eye candy. It’s lightweight. Easy to move over two feet or even move to another area of the porch. It only weighs about 20 pounds when empty. The built in storage area is amazingly useful. 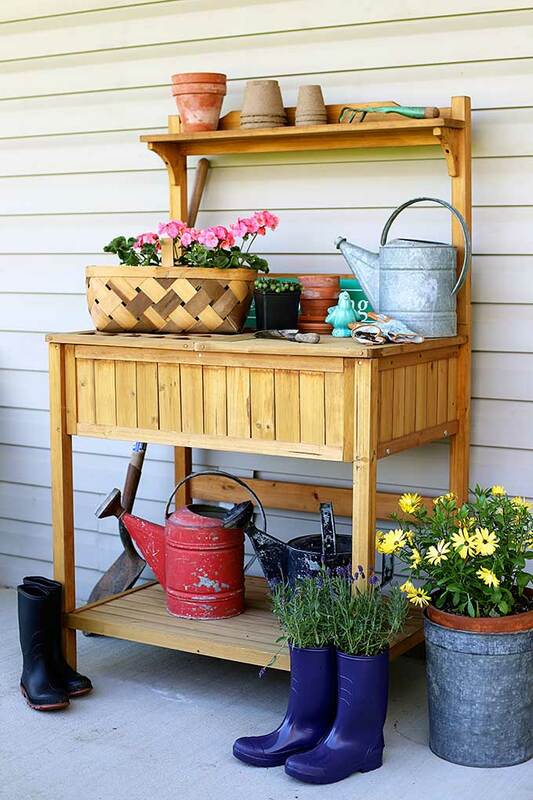 LOVE that it can do dual duty, handy potting bench one minute – delightful buffet station the next! The size is perfect for what I wanted. Not taking up so much space that I had to give up a piece of seating, but not so small it is useless. Everyone who has seen it in person has wanted to buy their own. Everyone. The price. Seriously, for the price you can’t beat it. The nuts and bolts or screws or whatever you call them that hold it together tend to loosen themselves up a bit here and there. I’ve tightened them 3 times in the year we’ve had it. Not a huge con, just wanted to mention that. We have it outside under our covered porch. The covered porch is only about 5 feet wide, so it was exposed to snow and rain during this never ending winter and looks as good as the day we put it together. But I would say if you are going to have it outdoors year round with absolutely no overhang in harsh, harsh tundra-like weather you may want to put a wood protector on it. The wood is a little on the soft side, so you will get nicks and dings, but people it’s a potting bench! Potting benches were not meant to be high end designer pieces of furniture! The top comes in two pieces and is removable!!! Full Top for maximum work space. Grated Top Removed to get to the storage below. I have a vintage enamel washtub full of dirt in that side so it’s easily accessible. 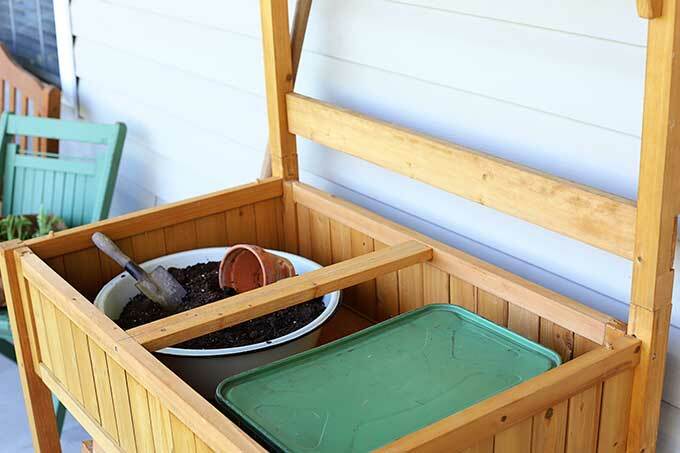 You could also put an empty plastic bin under the grate and use that side to catch dirt and debris as you are potting up stuff. Both Tops Removed to root around for stuff. That’s an old picnic tin I have in the right side filled with gardening gloves, peat pots and garden markers. Even though it doesn’t have a cute vintage cast iron sink or a hose hookup for running water, I still couldn’t resist throwing some old watering cans and some vintage gardening tools on her to bling her up a bit. I sorta can’t stop gazing at her. 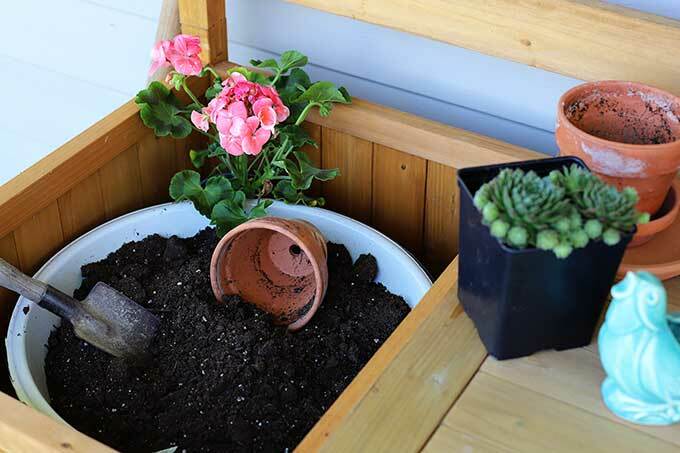 You may have recognized the lavender boots from my These Boots Aren’t Made For Walking post, that is really about how to make DIY rubber boot planters (why go with an obvious title, when a confusing one will do?). 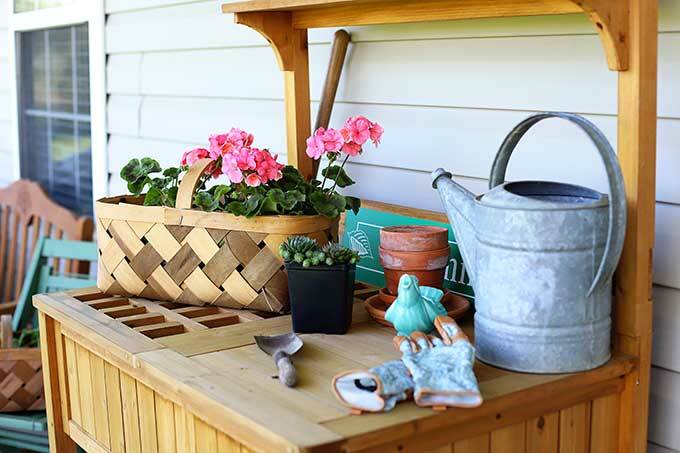 Yes, the potting bench can also double as a buffet station sort of thing for your porch. It comes in very handy when we’re eating outside. 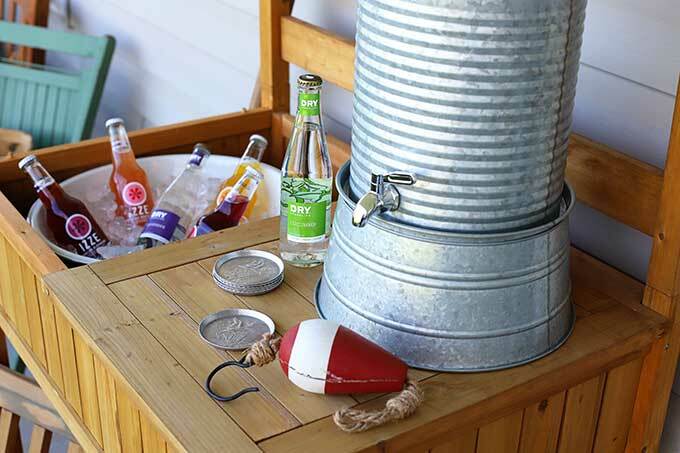 BTW, the same enamel washtub worked as a drink holder for last year’s graduation party. I just filled it with ice, inserted some bottled pop and we were good to go. 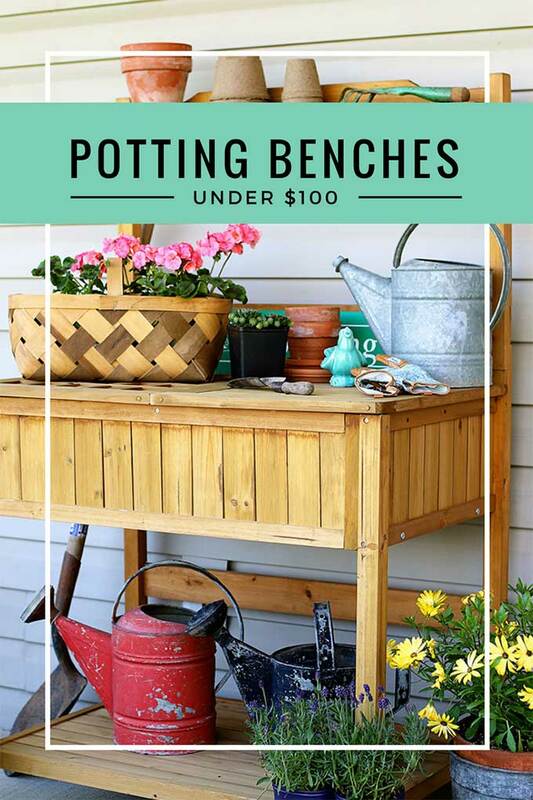 I’ve posted some other potting benches that are super affordable (at the time I’m posting this) down below here in case my lightweight, dual-duty wooden potting bench doesn’t do it for you. I’m inspired. I’ve been looking at the ratty old potting bench in my yard since spring began this year. (I’m in California) I’ve been thinking about asking my husband to build me a new one. But after seeing how cute and reasonably priced these are., I am buying the one your have. Thank you. It’s just what I want. I’m so sorry you hurt it as knee injuries are no fun. By the way, I believe that it’s play dead for bears and don’t run for dogs…..stand still but don’t stare them in the eyes as that is considered aggressive by canines. Hopefully your knee issue can be resolved by a brace and physical therapy for a while. But if not and surgery is required know that knee surgeries are way less invasive now than they were years ago with little scarring and a much quicker recovery period. I’ll cross my fingers for you that it can be resolved with a little physical for though. …..with a little physical therapy though. Thank you! I did physical therapy for an ankle injury last year and it was actually amazing! I’m hoping I can get away with that this time! It looks like this is the one that I helped my sister put together. The screws were brass (pro–they don’t rust) but they were very skinny with hardly any thread (con–they don’t hold worth a darn)) and we had a couple strip out completely. So we went to the hardware store & bought some that were just a little longer & a bit beefier with a real thread, Huge improvement. If we hadn’t been nearly done, I would have gone for replacing all the screws. They will rust over time (although this bench is in a covered area) but hey, if your bench falls apart you are not gonna look at the pile of wood & say “Isn’t it great that the screws didn’t rust?”. I would recommend that anyone assembling a potting bench kit should take a good look at the hardware before starting. It might be advisable to replace all the wimpy screws. Good idea! I had thought about maybe putting glue in the holes, but if they come loose again I think I’ll just try your longer/stronger screws! Air horn!!! Great idea. I had thought maybe a can of doggie pepper spray, but then I don’t want to spray a poor dog just because he’s a little too aggressive for his own good. Even if the doggie type is supposed to be lighter than the kind they make for people. The air horn sounds like a better option. Pam, the smallest air horn at Walmart is small enough to fit in my purse, or pocket, but the sound is very, very loud! It’s made by Attwood Signal Co. I carry one in my purse, after I had a scary experience in a public restroom. My husband and I keep one in the car and one by the front door, also. They’re good for hiking trips, camping, and in our case, when we’re outside, especially at night since we’ve had 4 black bear on our street! Wow, what a great price on Wayfair! $39???? That’s crazy! It has the same dimensions as the Hayneedle one, but it says weight is 35 lb. whereas the Hayneedle one says 20 lb. Thanks for the review – I might have to buy one for my porch. Just for décor, I have a real potting bench in my shed! Managed to snag one of the potting benches for $39 from Wayfair (sadly no longer available) for my mother-in-law as a Mother’s Day gift. Wonderful price for something she will actually use!!! Thanks for the great tip. Always love reading your stories. Just had my order for the potting bench cancelled by Wayfair without any explanation… learned my lesson to stay away from that company!!! Has anyone else had a similar experience with Wayfair? 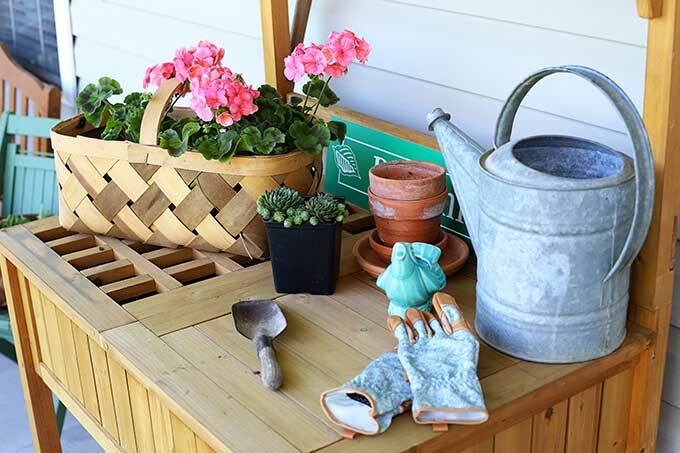 I love your new potting bench, Pam…functional and oh-so-beautiful! I sure hope your knee won’t need surgery! Sometimes DIY is not the better option. I always calculate my time having value and the cost of materials. I really like the versatility of your potting bench. I may need to hunt one down for myself.